You might think I've gone entirely mad recommending some smart lightbulbs as part of your PC gaming setup, but stay with me for a moment. Philips Hue lightbulbs aren't just for lazy people who can't be bothered with a light switch anymore and instead ask Google or Alexa to do everything for them, these classy and colourful bulbs can actually function as an extension to your PC gaming experience, and for someone who's obsessed with PC gaming setups, take it from me, the results are dramatic. Right, got your bulbs, now it's time for the magic to start. Equip them in lights either side of your monitor, or TV if you have a seriously fancy PC setup, and then download the Philips Hue Sync software on your PC. 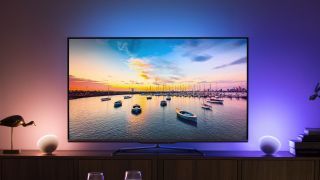 It's here that you'll be able to turn your bulbs into an entertainment area, that can accurately reflect what's being shown on screen, whether that's a game, or a movie or TV show. It extends the colours of your content beyond the edges of your screen, creating an immersive experience for your gaming that takes over the entire room. You can adjust the intensity, but trust me playing something like Dying Light in the dark and watching the Philips Hue lights pulse orange when a zombie is near you at night will seriously freak you out. Plus, some games have specific colour functionality for certain games if you sync them up in the Razer Synapse app, including Fortnite where your lights pulse purple when you're caught in the storm for example. Honestly, my gaming setup is so much better for it, and there are options for great working light when you're not gaming. The sadness hours, as they're really known. And if you want something a little more stylish, you might want to check out the Philips Hue Go lights or the Philips Hue Play, which all do the same thing but in a pre-packaged lighting setup.